TVK Cambodia camera crews use LiveU for live video transmission. 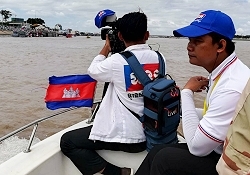 Hackensack, N.J., December 2017: TVK, The National Television of Kampuchea (TVK) in Cambodia, has selected LiveU for its daily newsgathering after using the company’s LU600 HEVC solution to cover last month’s three-day Water Festival (“Bon Om Touk”). The deal is being managed by LiveU’s Thai partner DSC which provided on-site support at the event. Using LiveU units, TVK’s camera crew creatively captured the carnival atmosphere of the festival, one of the biggest events in Cambodia which attracts millions of people every year. Firework displays were held at the river and more than 400 boats took part in the annual boat race.